Larry Dixon heads for the top qualifying spot in Top Fuel at U.S. Nationals. The 2009 Mac Tools U.S. Nationals is turning into the John Force Racing show as the top four qualifiers through the first three rounds of qualifying in the Funny Car division race are JFR drivers. Robert Hight leads that bunch, and behind him are Ashley Force Hood, Mike Neff and John Force. Larry Dixon, Mike Edwards, and Hector Arana join Hight as Friday leaders who now head into Sunday’s final two rounds with the qualifying leads. A couple of drivers took shots Dixon Friday night, but his 3.850-second run kept him in the No. 1 spot. “I have egg on my face, because I said that the 3.85 wouldn’t hold up,” said Dixon. “I really thought that it would take an .80 or an .81 to take the pole tonight. There were a whole lot of .85s, and we just happened to be on the right side of them. We were trying to run a low-.80 as I’m sure a lot of other guys were, but for one reason or another it didn’t work. Antron Brown’s 3.852 came close to Dixon and later was supplanted for the No. 2 spot by Cory McClenathan, who regained the position he held directly behind Dixon Friday with a 3.851. It’s a close-knit field up top as five drivers qualified with 3.85s, with Tony Schumacher (3.855) and Morgan Lucas (3.859) right behind the top three. Doug Kalitta is qualified sixth with a 3.877, just ahead of the surprising Pat Dakin, who clocked a stunning 3.880 to grab the No. 7 spot. Rod Fuller, in just his third race of the season, rounds out the top eight with a 3.888. Terry Haddock’s 3.914 is the 12th-best run and the last to transfer into Sunday’s qualifying. Outside the top 12 and needing to make a quick run in Sunday’s final two sessions are both Joe Hartley and Clay Millican, who are battling for the final spot in the Countdown to 1 field. Hartley ran 3.919, which was 13th best, after failing to make it down the track on his first two passes. Millican’s best so far is a 3.935, 15th quickest. Hight entered the final session atop the Funny Car field with his Friday 4.107, then watched boss John Force take it away with a similar pass at a better speed. When Hight’s turn came to run, he steered the Automobile Club of Southern California Mustang right back to the top with a 4.082 and was joined by the boss’ daughter, Ashley Force Hood, who ran 4.093 alongside him. Mike Neff squeezed into third, also ahead of his team owner, with a 4.093 in the day’s final pass. Del Worsham occupies the fifth spot and the first non-JFR position after reeling off a solid 4.109 in the Al-Anabi Toyota, now tuned by Dickie Venables. Behind him, in another Toyota, is reigning season champ Cruz Pedregon, who’s flexing his muscles and showing his intent to hold onto a spot in the Countdown’s top 10 for a shot at defending his season title. Pedregon started the day third but slipped to sixth. Jeff Arend has the No. 12 position with yet another Toyota, the DHL entry of Connie Kalitta. Arend’s best pass was a 4.184 recorded Friday. Mike Edwards is more than halfway to his 10th No. 1 spot of the season in Pro Stock, holding the lead through three of the five qualifying sessions with a stout 6.581 recorded Saturday morning. Edwards’ ART/Young Life Pontiac has been the class of the field through all three sessions, including a 6.623 in the day’s final pass. “This morning’s run, condition-wise, was better; tonight was a little more humid,” said Edwards. “We made another great run this morning, but then we had a misfortune with the engine and changed it. We were still low of the round, but it wasn’t quite what we wanted. Jason Line is a distant second behind Edwards, almost four-hundredths back with a 6.620 in the first of three Summit Pontiacs in the top five. Ronnie Humphrey, who began leasing a Pontiac from the Summit team in Reading, is a surprising No. 3 with a 6.630. Behind him is the Dodge of Allen Johnson (6.633) and the third Summit Pontiac of five-time Indy winner Greg Anderson (6.635). Rodger Brogdon’s 6.650 is in the 12th and final spot to transfer into Sunday’s final two passes. Johnny Gray, trying to bust him way into the Countdown top 10 is qualified No. 10 at 6.647, while Warren Johnson, 10th in the Countdown field, is currently not qualified after a 6.661 best. Arana didn’t win the Pro Bike Battle final, but he did up the pressure on his two-wheeled peers by picking up a half-tenth over his Friday-leading pass, charting a 6.936 aboard his Lucas Oil Buell to front the pack heading into Sunday’s final two passes. Arana is gunning for his fifth No. 1 of the season. Hines’ day also was highlighted by a position improvement as he moved past Matt Smith and into second place on the ladders with a 6.957 aboard the Screamin’ Eagle/Vance & Hines Harley Davidson after Smith could only muster a 6.968 in response from his Nitro Fish Suzuki. Shawn Gann, battling for one of the final spots in the Countdown to 1 is looking sharp with a 6.978 that has his RumBum Buell in the fourth spot. It’s a season high for Gann whose previous best was sixth in Brainerd. Behind Gann is another surprise, L.E. Tonglet, who is fifth on one of Smith’s old Buells with a 7.015. Steve Johnson and Karen Stoffer, who also are battling for their playoff hopes, are qualified sixth and ninth, respectively, with passes of 7.016 and 7.023. Doug Horne’s 12th-place 7.087 is the final time that will transfer to Sunday’s final sessions. 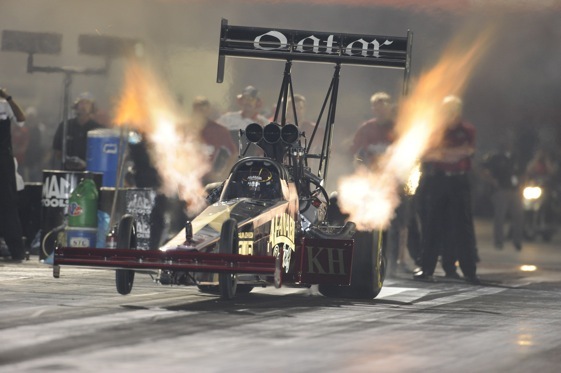 Results Saturday after the first three of five rounds of qualifying for the 55th annual Mac Tools U.S. Nationals presented by Lucas Oil at O’Reilly Raceway Park at Indianapolis, 18th of 24 events in the NHRA Full Throttle Drag Racing Series. Qualifying will continue Sunday for Monday’s final eliminations. Top Fuel — 1. Larry Dixon, 3.850 seconds, 306.81 mph; 2. Cory McClenathan, 3.851, 311.63; 3. Antron Brown, 3.852, 314.39; 4. Tony Schumacher, 3.855, 313.51; 5. Morgan Lucas, 3.859, 314.61; 6. Doug Kalitta, 3.877, 315.12; 7. Pat Dakin, 3.880, 312.21; 8. Rod Fuller, 3.888, 310.63; 9. David Grubnic, 3.902, 313.07; 10. Shawn Langdon, 3.904, 310.27; 11. Brandon Bernstein, 3.908, 308.78; 12. Terry Haddock, 3.914, 300.60. Not Qualified: 13. Joe Hartley, 3.919, 289.76; 14. Bruce Litton, 3.931, 307.37; 15. Clay Millican, 3.935, 309.56; 16. Spencer Massey, 3.942, 306.81; 17. T.J. Zizzo, 3.945, 301.74; 18. Troy Buff, 3.950, 291.32; 19. Del Cox Jr, 3.978, 300.80; 20. Ron August, 4.037, 288.21; 21. Chris Karamesines, 4.169, 234.94; 22. Luigi Novelli, 5.413, 121.01. Funny Car — 1. Robert Hight, Ford Mustang, 4.082, 308.35; 2. Ashley Force Hood, Mustang, 4.093, 309.20; 3. Mike Neff, Mustang, 4.093, 308.85; 4. John Force, Mustang, 4.107, 307.09; 5. Del Worsham, Toyota Solara, 4.109, 303.98; 6. Cruz Pedregon, Solara, 4.124, 303.84; 7. Bob Tasca III, Mustang, 4.126, 302.69; 8. Tim Wilkerson, Mustang, 4.128, 303.78; 9. Jim Head, Solara, 4.143, 304.46; 10. Tony Pedregon, Chevy Impala, 4.147, 300.93; 11. Matt Hagan, Dodge Charger, 4.171, 299.46; 12. Jeff Arend, Solara, 4.184, 297.55. Not Qualified: 13. Jack Beckman, 4.184, 296.89; 14. Ron Capps, 4.225, 292.65; 15. Bob Bode, 4.237, 290.69; 16. Brian Thiel, 4.238, 294.63; 17. Jerry Toliver, 4.254, 284.45; 18. Grant Downing, 4.310, 227.27; 19. Justin Schriefer, 6.436, 102.70. Pro Stock — 1. Mike Edwards, Pontiac GXP, 6.581, 209.01; 2. Jason Line, GXP, 6.620, 208.23; 3. Ronnie Humphrey, GXP, 6.630, 207.88; 4. Allen Johnson, Dodge Stratus, 6.633, 207.91; 5. Greg Anderson, GXP, 6.635, 208.30; 6. Greg Stanfield, GXP, 6.637, 207.78; 7. Ron Krisher, Chevy Cobalt, 6.641, 207.78; 8. Ryan Ondrejko, GXP, 6.641, 206.95; 9. Vinnie Deceglie, Stratus, 6.646, 207.37; 10.Johnny Gray, Stratus, 6.647, 207.72; 11. Jeg Coughlin, Cobalt, 6.650, 208.04; 12. Rodger Brogdon, GXP, 6.650, 207.85. Not Qualified: 13. Larry Morgan, 6.655, 207.56; 14. Steve Spiess, 6.656, 207.21; 15. Warren Johnson, 6.661, 207.94; 16. John Nobile, 6.665, 206.95; 17. Rickie Jones, 6.667, 207.02; 18. Kurt Johnson, 6.675, 207.43; 19. Justin Humphreys, 6.687, 205.47; 20. Matt Hartford, 6.691, 206.80; 21. Bob Benza, 6.703, 205.22; 22. Steve Schmidt, 6.709, 204.85; 23. V. Gaines, 6.727, 204.60; 24. Jim Cunningham, 6.753, 203.83; 25. Kevin Lawrence, 6.793, 202.82; 26. Mark Buehring, 6.816, 202.03; 27. Mark Hogan, 6.819, 203.92; 28. Frank Gugliotta, 6.819, 201.43; 29. John Gaydosh Jr, 6.822, 201.97; 30. Erica Enders, 6.823, 201.46; 31. Dave River, 6.963, 196.53. Pro Stock Motorcycle — 1. Hector Arana, Buell, 6.936, 191.89; 2. Andrew Hines, Harley-Davidson, 6.957, 192.66; 3. Matt Smith, Suzuki, 6.968, 190.65; 4. Shawn Gann, Buell, 6.979, 189.66; 5. LE Tonglet, Suzuki, 7.015, 186.77; 6. Steve Johnson, Suzuki, 7.016, 187.91; 7. Eddie Krawiec, Harley-Davidson, 7.018, 188.57; 8. Michael Phillips, Suzuki, 7.023, 191.46; 9. Karen Stoffer, Suzuki, 7.023, 186.30; 10. Chip Ellis, Suzuki, 7.028, 187.47; 11. Bailey Whitaker, Buell, 7.066, 186.54; 12. Douglas Horne, Buell, 7.087, 187.31. Not Qualified: 13. Angie McBride, 7.090, 184.37; 14. Wesley Wells, 7.099, 187.16; 15. Jim Underdahl, 7.099, 187.00; 16. Craig Treble, 7.102, 188.49; 17. Junior Pippin, 7.122, 183.87; 18. David Hope, 7.140, 182.23; 19. Redell Harris, 7.167, 183.02; 20. Joe DeSantis, 7.176, 185.82; 21. Mike Berry, 7.186, 181.40; 22. GT Tonglet, 7.196, 183.69; 23. Katie Sullivan, 7.197, 183.27; 24. Geoff Godfrey, 7.752, 164.25. FINAL — Hines, 6.970, 192.58 def. Arana, foul.